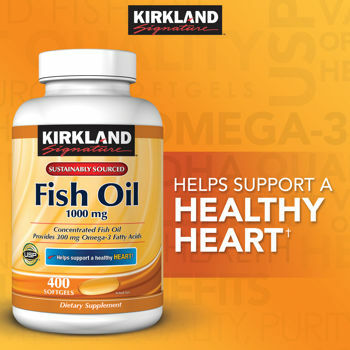 Kirkland Signature™ Fish Oil Concentrate 1000 mg - 400 Softgels SALE! Kirkland Signature fish supply comes from deep ocean waters. The fish oil is not supplied from farm-raised fish. State-of-the-art molecular distillation process is used to remove mercury, PCBs and dioxins, which guarantees purity and potency with reduced fish odor. The fish oil is derived from a variety of fish species, to maximize omega-3 fatty acid concentration. Fish Oil naturally contains the Omega-3 Fatty Acids, EPA and DHA. Suggested Use: Take one softgel three times daily with a full glass of water, preferably after a meal. Each Softgel Contains - % Daily Value: Calories 10 (Calories from Fat 10), Total Fat 1 g - 2%*, Saturated Fat 0.5 g - 3%*, Polyunsaturated Fat 0.5 g - **, Monounsaturated Fat 0 g - **, Cholesterol 10 mg - 3%, Natural Fish Oil Concentrate 1000 mg [Containing EPA (Eicosapentaenoic Acid) 180 mg, DHA (Docosahexaenoic Acid) 120 mg] - **. *Percent Daily Values are based on a 2,000-calorie diet. Ingredients: Fish Oil Concentrate, Gelatin (non-bovine), Glycerin, Water, Tocopherol. Contains: Fish (Anchovy, Herring, Salmon, Sardine and Sprat) and Soy. Caution: If you are pregnant or nursing, taking medication, facing surgery, have bleeding problems, or undergoing any other treatment which may affect the ability of blood to clot, consult your physician before taking this product. Keep out of the reach of children.